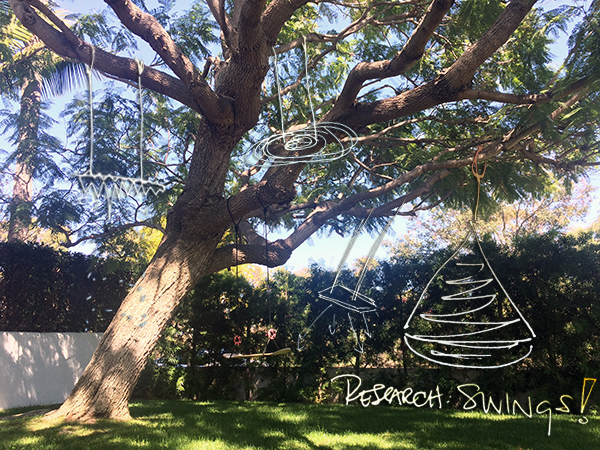 It all started with our SWING RESEARCH… that scribble on the top left? 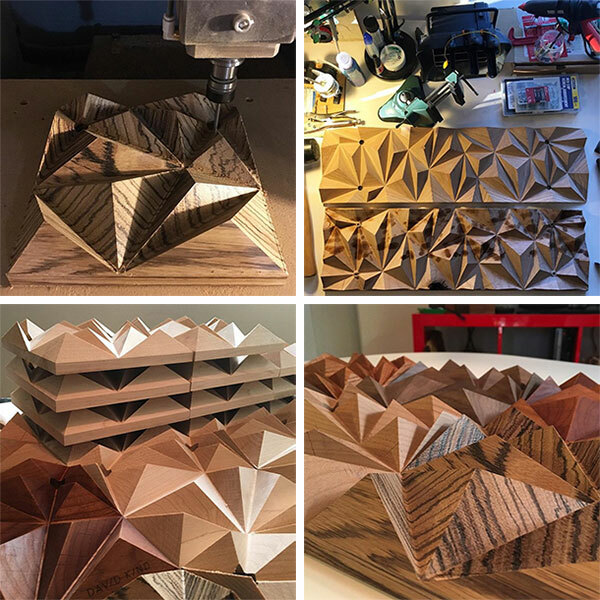 Inspired ideas of facets in wood! Modeling the first pass at the swing, we made it about the size of a skateboard, and then cut a piece of the model to fit a scrap piece of knotty maple we had around the shop. With our idea ready to test, we popped the maple into the Roland Model A MDX 540S we were good to go! 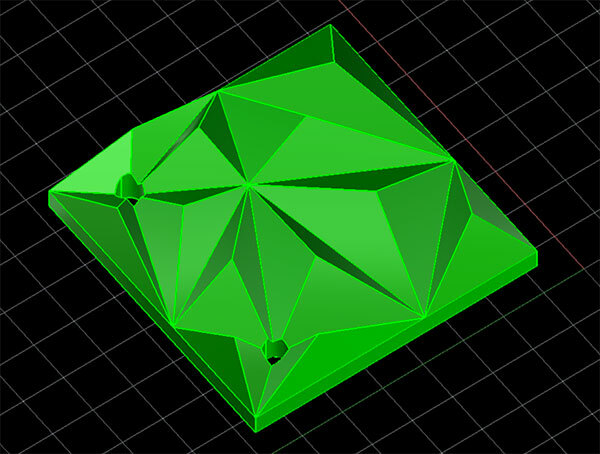 I love how the knot added fun curves and topography to the piece. We also 3D printed a mini version of the swing to help visualize things. With a few tweaks to how the peaks were arranged… we didn’t love the burst pattern on such a large scale, so mixed it up a bit more for the final swing model. Also - the more we played with the swing idea, the more it grew on us that this fun faceted plank could also be an incredible SHELF! 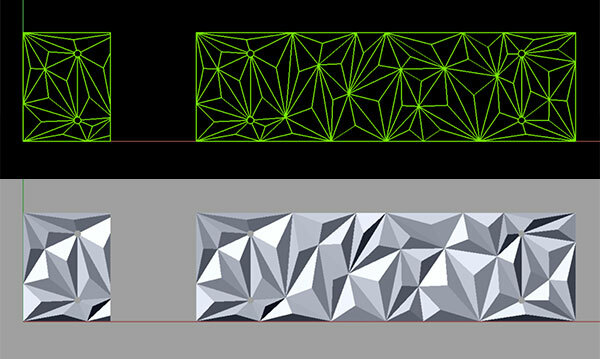 both with the facets facing up or down. Time for a full scale white oak prototype! 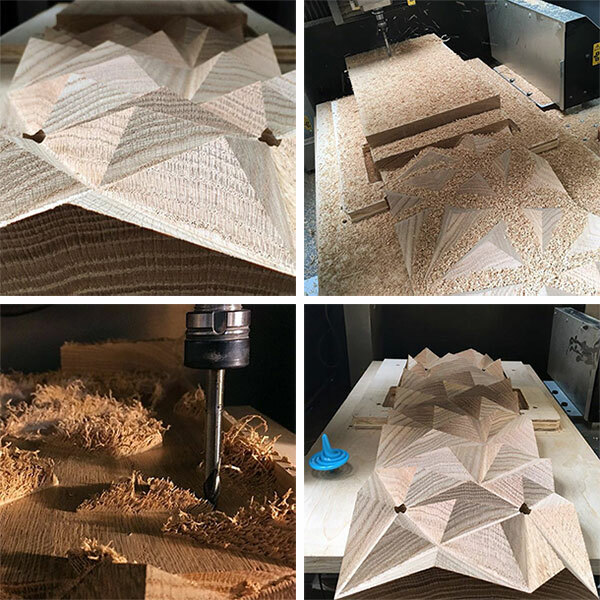 With the milling bed being a bit small for our swing, we set up a key-jig system to allow us to mill half, rotate the piece, and mill the other half with everything perfectly lined up! It worked like a charm - though sadly with the heatwave and rolling power outages, things got a bit more exciting than necessary. Also learned the hard lesson of how critical it is to triple check all file setups when the bit ate right through one of the peaks! Around the time we were prototype milling, Dave Barton (founder of David Kind) happened to stop by to share some new glasses and catch up… somewhere between the beers & guac his glasses were popped into the early knotty maple prototype and we were all enamored by the way they looked. 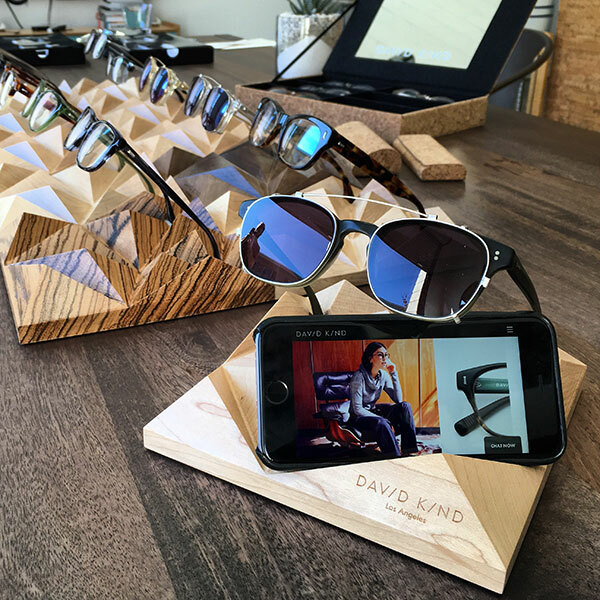 None of us could get it out of our heads, and the idea for David Kind Eyeglass Stands were born! 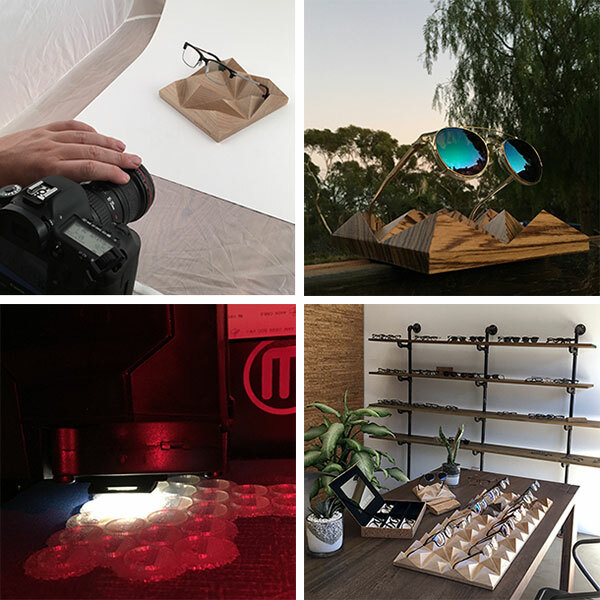 Modeling the stands meant taking the concept from the swing/shelf and tweaking it a bit to make sure the holes were perfect for glasses and the peaks below not only looked great below/through the lenses, but also has a secret purpose… holding your phone! Milling the first few stands on the Roland CNC, the chocolatey look of the walnut was amazing. 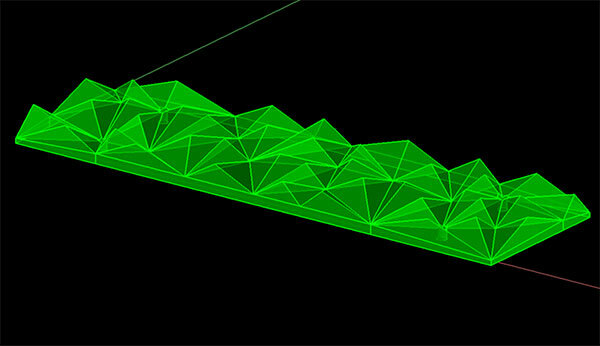 Also how pretty are the milling paths? 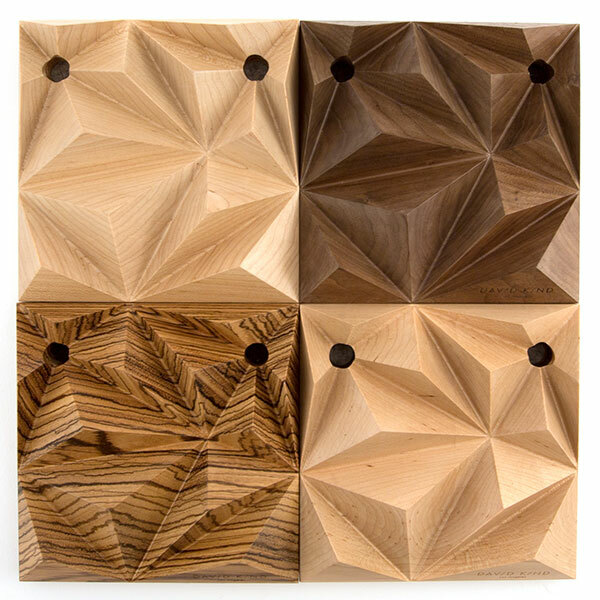 While the majority would be made in maple, we also found some gorgeous exotic zebra wood for a special stand. 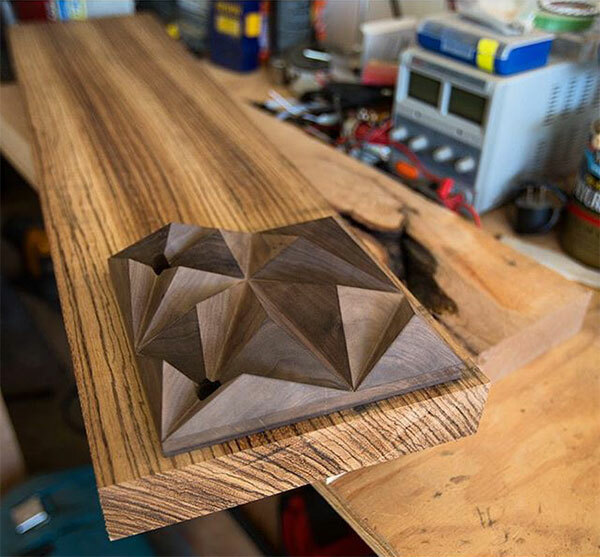 The finished walnut stand is on top! 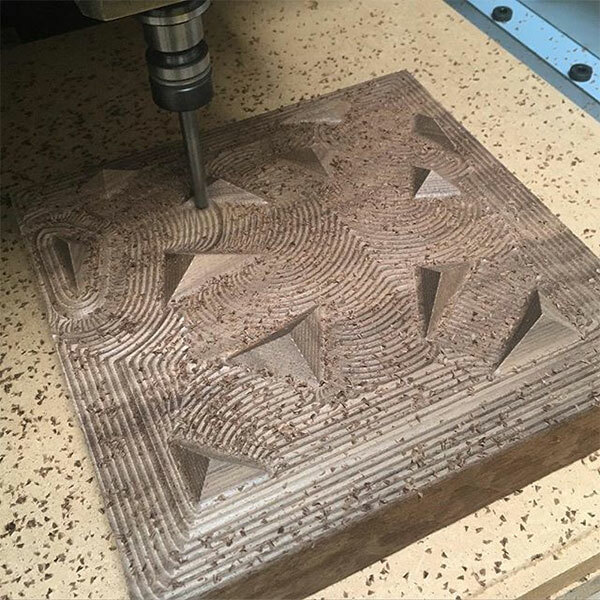 We milled the zebra in house - SUPER SLOWLY to make sure nothing chipped out or went wrong. The smoothness right off the mill is stunning! 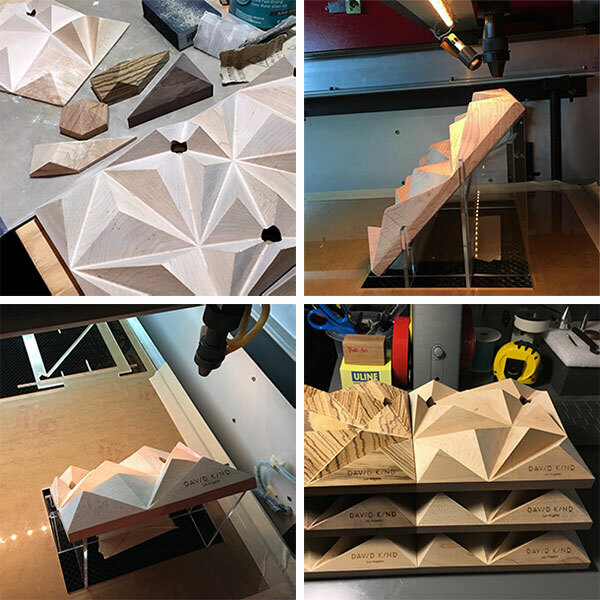 Simultaneously we started researching other local folks to outsource some milling to… for both the swing and glasses stands. 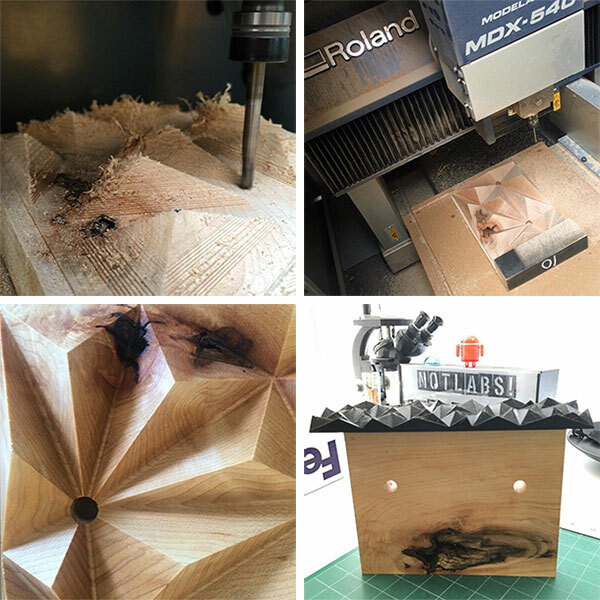 As you can see in the top right, some experiments in outsourcing went worse than others… that one ended up splattered in oil, chunky in finish, holes weren’t milled out, and the edges seemed to be chopped off oddly with a bandsaw or something. On the bottom left however, we got 20 hard maple stands! While the finish wasn’t quite as smooth as ours, it was nothing some sanding couldn’t fix, and they had it done in a few days! The next step was LOTS of sanding from 60 to 100 to 220 grits! and testing out various finishes. Then laser etching the logos with a jig to hold the facet flat. In typical NOTCOT fashion… a surprising press kit from Igloo Coolers came encouraging us to LIVE IT UP! 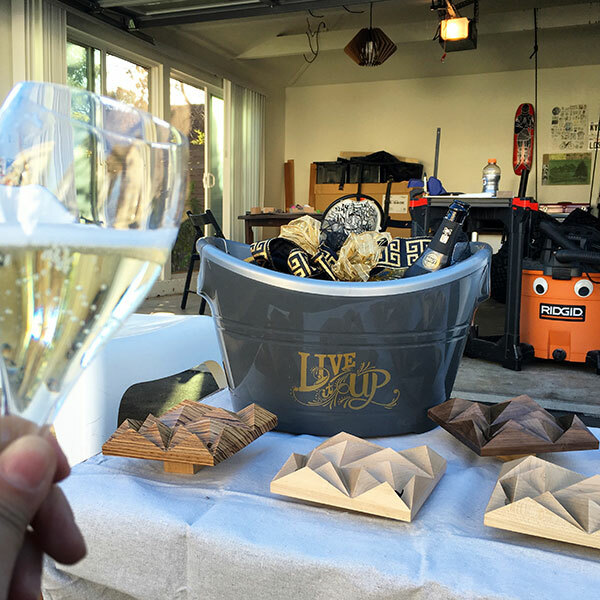 So we did… while sanding and finishing! 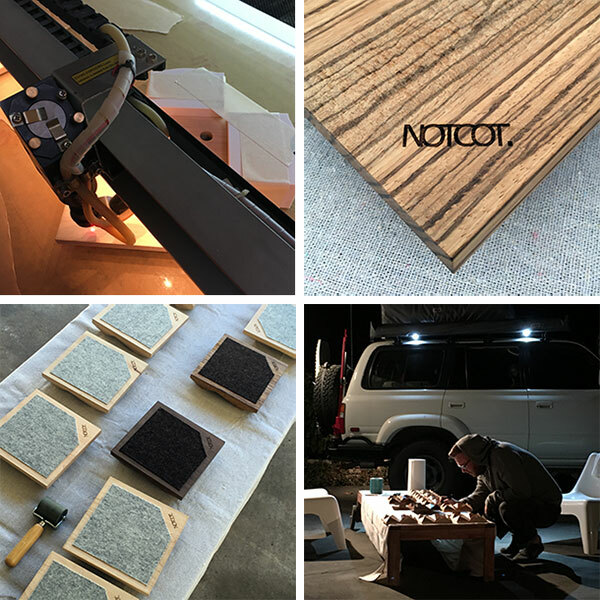 For the David Kind editions - in addition to their logo on the front (either on the facet, or below on the edge) - we added the NOTCOT logo on the base before finishing it and adding the 1mm felt. I love the way the felt not only protects the wood and the surface you place it on, but also lets the whole stand hover ever so slightly! We really do work all hours, and use the NOTFZJ for everything… including lighting up the stands in the driveway as Shawn inspects them! The last steps before delivery? Photoshoot! While also 3D printing inserts to hold the glasses. With so many different glasses out there - and different angled arms, etc. It’s impossible to have them all sit JUST where you want them. 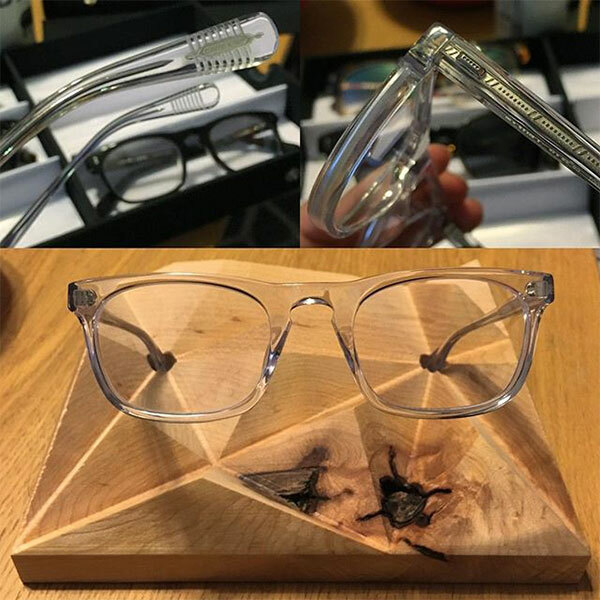 So we designed inserts based on the various David Kind designs to accommodate them all - with a slight twist of the insert you can adjust the height your glasses cantilever over the stand! The most exciting moment yet… DELIVERY!!! 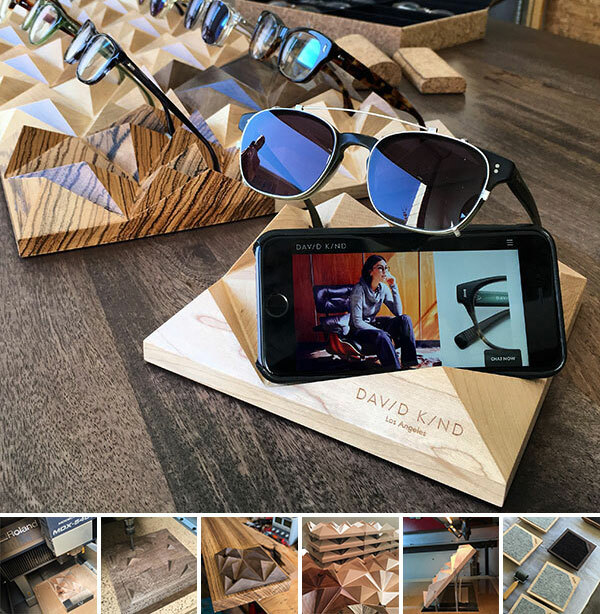 To see all the stands together filled with the various David Kind glasses (and an iPhone 6S showing the website) was surreal. 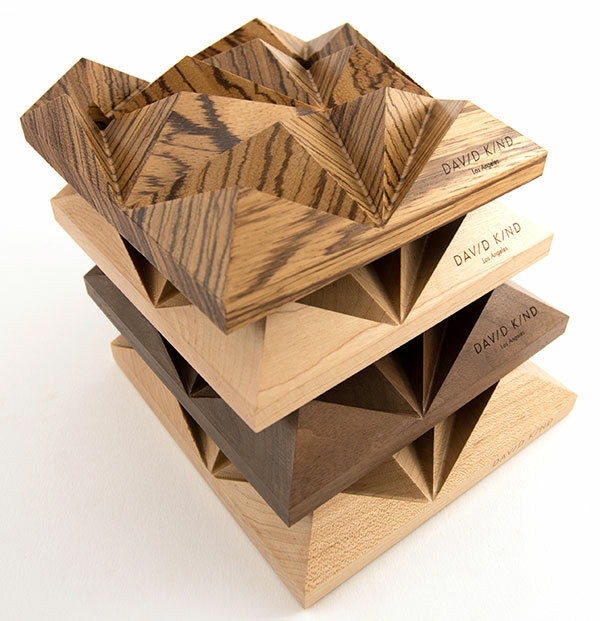 And just like that… you have the NOTCOT for David Kind Glasses Stands! See more pictures of the final stands here!!! This is a brilliant idea. I love the aesthetics. It would go perfectly on my nightstand.